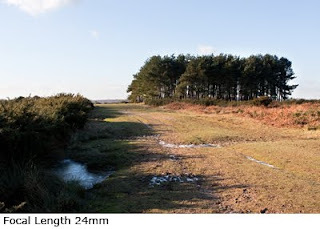 In this exercise we are asked to take three photographs of the same scene, noting the exact position the photographs were taken from. As the weather was fair I went with my son to the Ashdown Forest. The first photograph was with a focal length equivalent to the naked eye, that is objects appearing the same size through the lens as they do through the eye. When I took the picture below I recorded a focal length around 50mm on the barrel of the lens, the Exif data confirmed this to be 52mm. 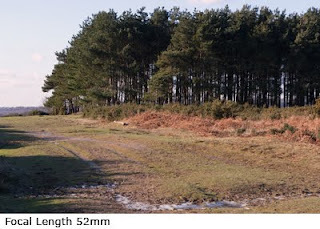 The second photograph was taken at the widest focal length of the lens, for the lens I was using this was 24mm. 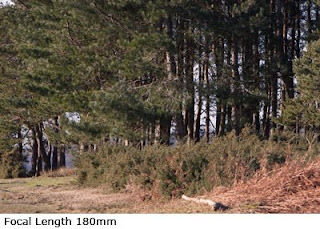 Finally that last of the three photographs was taken at the telephoto end of the lens which was 180mm. In hindsight this was a little too long for the exercise, but it still showed the principles of focal lengths and finding the standard focal length of the camera. We were then asked to print out these images on to A4 and return to the position where they were taken. Holding them up to the view we were to offer them up adjusting the distance between the eye and the photograph so that the view was exactly aligned with the print and measuring this distance for each of the above three photographs from eye to print. The results I obtained for my pictures were 48cm for 52mm , 22cm for 24mm and 180cm for 180mm. Not surprisingly the focal length and measured distances are directly proportionate at around x10 the focal length.